Need Bosch Vision 300 Series WFVC3300UC 4.4 Cu. Ft. Front Load Washing Machine Review & Rating? Generally when washing machine manufacturers increase washer capacity the machine tends to become less efficient. This certainly isn't the case when reviewing Bosch washing machines. The Bosch Vision 300 Series features both colossal capacity at 4.4 cubic feet and ultra efficiency, with total annual energy consumption estimated at 130 kWh. 130kWh would be considered low for much smaller washers, so kudos to Bosch being able to incorporate this into a colossal sized machine. The Bosch Vision 300 Series WFVC3300UC comes in at approximately $700 list. Standout features include XxtraSanitary cycle which heats water to 170F helping kill 99.9% of most common household bacteria and allergens, high spin speeds (1,100 RPM) for shorter dryer times, 45 minute cycle time and virtually silent operation at 52 dBA. The Bosch WFVC3300UC is feature packed and a great value at its price point based on our review. #1) Energy Efficiency: The Vision 300 series carries on Bosch's reputation for building ultra efficient washers. 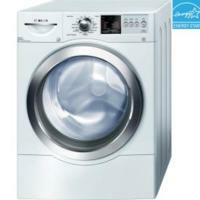 The washer exceeds ENERGY STAR 2011 guidelines and uses only 130 kWh/yr. Bosch's ActiveWater system essentially turns 13 gallons of water into 400 gallons of washing power helping make Bosch become the most water efficient washer brand in the U.S. The machines efficiency also helps contribute to its super quick cycle times of only 45 minutes. #2) Quiet Operation: Very quiet operation makes this unit ideal for second story installations or anywhere where additional noise isn't welcome. Part of this can be attributed to Bosch's proprietary AVS Anti-Vibration Technology. All this helps the washer operate at a near silent 52 dBA. #3) Great User Reviews: Most Bosch Vision 300 reviews are positive, praising low noise, great value, colossal capacity and quick cycle times. Expert Reviews are also extremely positive; helping the Bosch Vision 300 receives multiple awards including a Good Housekeeping Seal. #4) Great Cleaning: Intelligent sensors help promote constant cleaning. If you have a family, especially with young children, you'll appreciate this washer's ability to wash at 170F. These temperatures help the Vision 300 achieve NSF Certification and ensure the elimination of 99.9% most common household bacteria. #5) Huge Capacity: At 4.4 cu. ft. the Bosch Vision 300 will have no trouble tackling large family demands, including multiple towels or king sized comforters. #1) Load Balancing: The Bosch Vision 300 did experience some vibration when presented with overstuffed loads. This can be avoided by not over cramping the unit. #2) User Interface: The controls are electromechanical and are less sophisticated then other models we've reviewed. The Bosch Vision 300 WFVC3300UC is a great buy at $700. You can get other good machines in this price range, but generally not ones with 4.4 cu. ft. of huge capacity and such incredible efficiency on found in Bosch washers. Considering this unit is very efficient, cleans well, offers multiple cycles including XxtraSanitary to kill allergens and common bacteria, this is a great value buy. Mesh all this with a 2 Year Limited warranty backed by Good Housekeeping Seal and you have a feature packed reliable washing machine based on our review and comparisons.